Hello there beautiful people! I am really excited about today’s post! 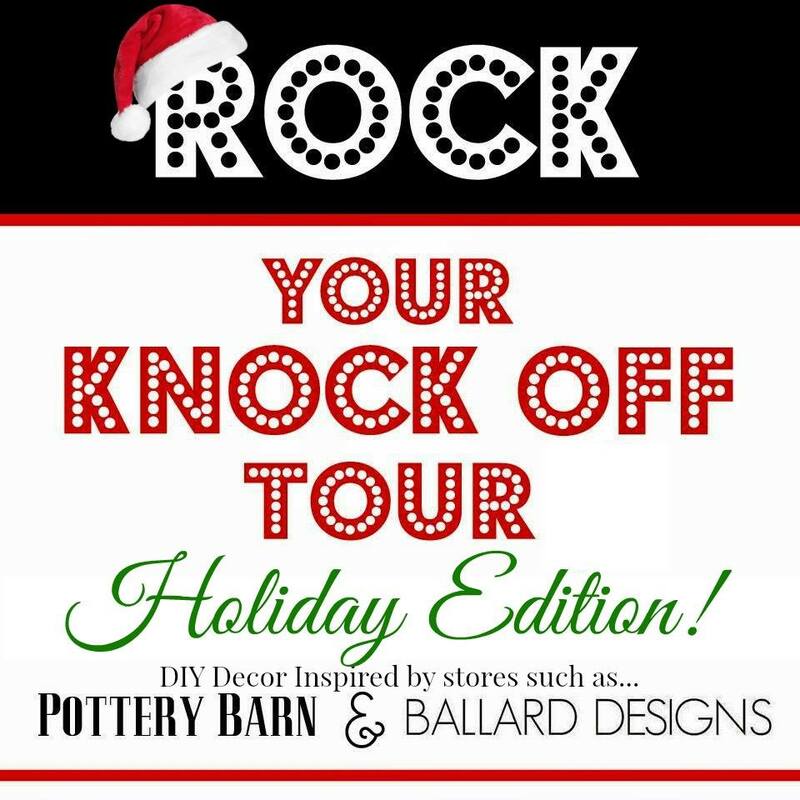 This is part of the “Rock Your Knock-off Holiday Edition” Tour where some of my favorite blogging friends and I find high-end (and very over-priced) items, and make them for a fraction of the cost. This very colorful gem will set you back about $48. Hmmm… x four for each member of my crew would run me about $200! No way! I’d rather spend that on the goodies that will fill them! I usually try to copy as close as possible to the originals when we do these tours, but this time, I altered it just a tad to suit my décor a bit better. It looks quite a bit different, but it was completely inspired by the original version above. Want to know the best part about this project? It was FREE! I was all set to head to my favorite thrift store to hunt down some sweaters when I remembered a bag of clothes waiting to be donated in the garage. I found four sweaters in there that were perfect! What are the chances?? They were a perfect mix of creams and soft greys. Gather up your finest sweaters. Cut your sweaters into strips. Mine varied from 2″-3″strips. Using a rotary cutter and a straight edge is a life saver here. I cut a lot of strips ya’ll. You’ll see why soon. Lay out your strips to get the look you want. Sew each strip together leaving the strips that will connect to the heel, not sewn. Cut a triangular piece for the heel. Pin the back in place. Sew the back to the front. Make a few tiny cuts along the inside curve of the stocking, so that seam will turn right-side-out nicely. Seal the edges all the way around with a zigzag stitch. 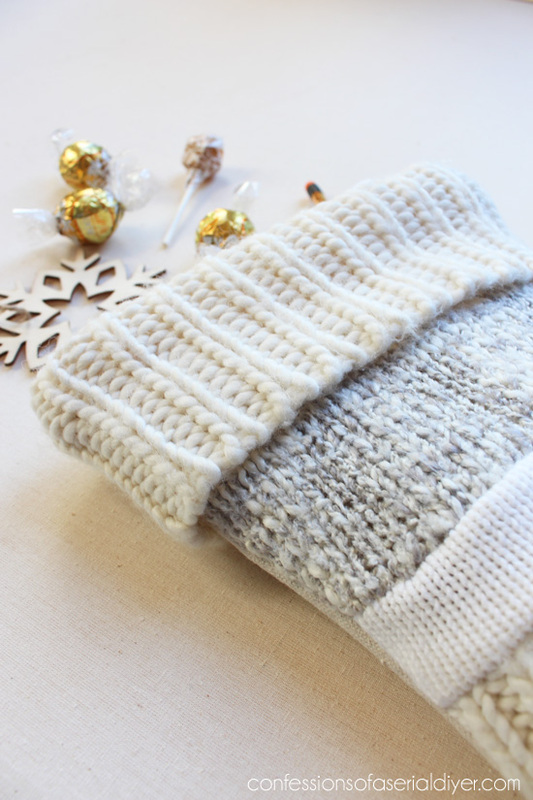 Save the neckline or bottom of your sweater to use for the top of the stocking. Place the side you want to see face down around the edge of the stocking and sew in place, except for where the ends will come together. (At the back of the stocking.) Leave about 1/4 ” unattached at both ends. Sew the ends together and seal that seam with a zigzag stitch. Also seal the seam where the finishing cuff and the top of the stocking were sewn together. Turn right-side-out. 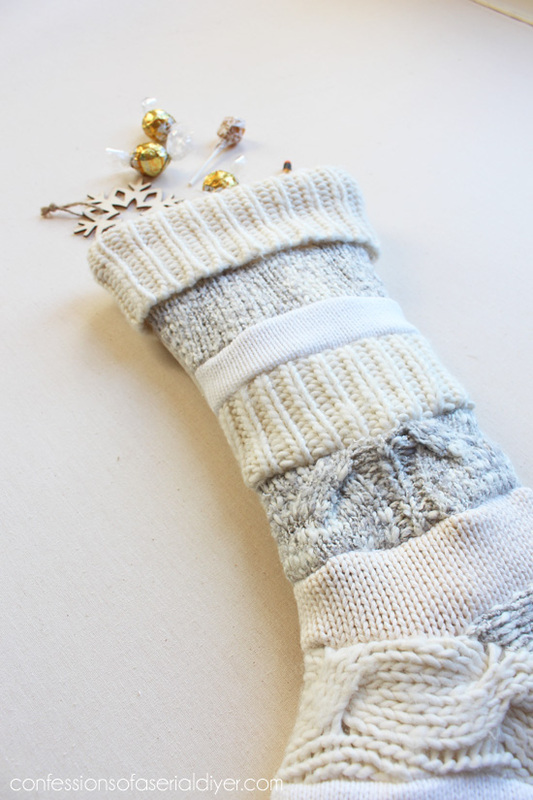 For the hanging loop, cut a piece of sweater 2″X 6″. fold right sides together lengthwise and straight stitch. Seal with a zigzag. Fold in two and attach to the inside back of the stocking. There you have it…in just 23 easy steps ha ha. 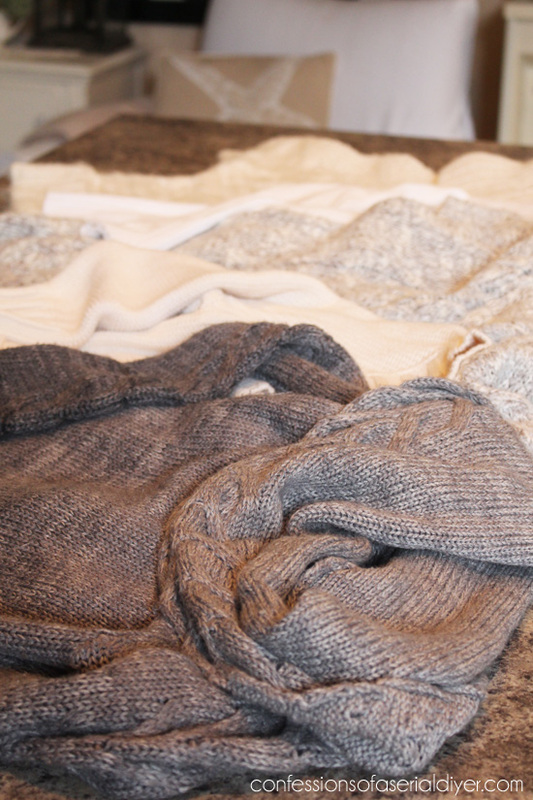 I love the texture of the sweaters for a warm and cozy feel. Nothing says winter like a cozy sweater! I told you I cut a lot of strips in my pictorial instructions… because I made one for each of us! See my whole Christmas Tour HERE. Don’t forget to see what my friends are knocking off for the Holidays too! Several will be sharing each day this whole week! So awesome Christy!! I thought about hanging some matching stockings across the mantle this year and after pricing them, quickly decided that making my own was the only way to go~I LOVE what you have created!! You must train your guys that design is much more important than old stockings 🙂 just kidding [I make sure the old ones come out Xmas eve] I have some sweaters just dying to be stockings, great tutorial, thank you! Those are really cute and honestly I like your version better. We’re all attached to our stockings as well so maybe you could decorate with those and Santa could leave the stuffed stockings in the old ones so everyone still gets their warm fuzzies? OMG I want these stockings so much! They are stunning, you did an amazing job Christy! I love yours way more than the originals too! Christy, this is so beautiful and classic. These will be dear to your little ones one day. 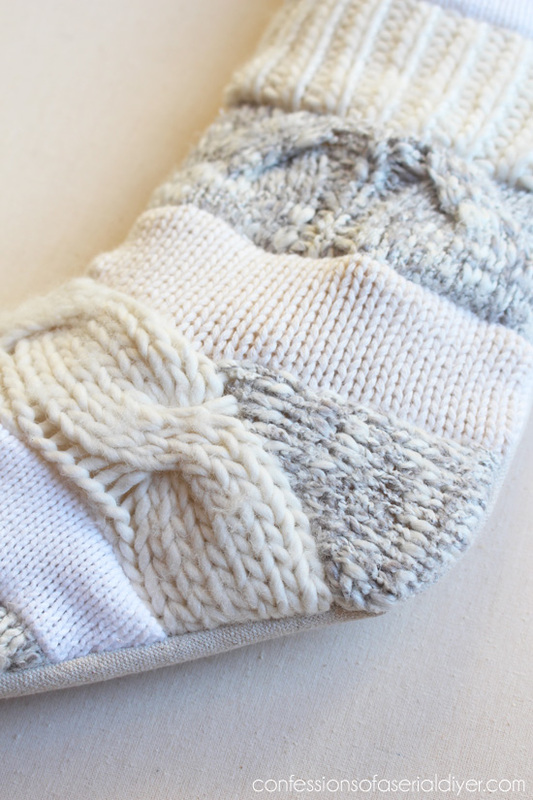 Love love love your sweater stockings and how easy are they to make! Would make awesome gifts too. Oh Christy thanks for the chuckle this morning – “these are just old sweaters”. Boys, gotta love em! omigosh so cute! Are you selling these??? Thanks so much, Jeanette! Yep, I think you missed your window for the pumpkins ha ha…I do that all the time! I have an old headboard in the garage that was going to be a “Dead and Breakfast” sign for Halloween. I got as far as painting it lol. I am in LOVE Christy!!! These are hands down my favorite stockings yet! I’ll definitely be making some of these to hang from our mantel!!! Haha Christy, gotta love our kids’ honest opinions but at the same time how sweet that they are sentimental about their original stockings! Your knockoff version is so PRETTY, I love the colors so much better than the original! Well done 🙂 Now how to get rid of the clowns!!!!! – That’s a tough one! Ha ha, I never knew my son was so sentimental about his stocking. I’m going to try laying them under the tree and hanging these on the mantel. We’ll see how that goes. My hubby will probably be the first to change his out for that damned clown one when I’m not looking.LOL! These turned out so pretty Christy! I love the colors you chose! I made our whole family stockings from those kits with a million beads which take forever! I keep trying to replace them every year but my daughter won’t let me even though she’s 17! I would love some like yours! I love your sweater stockings! They are absolutely adorable and you’ve done an amazing job. I’m so inspired! I definitely like your version better than the original. 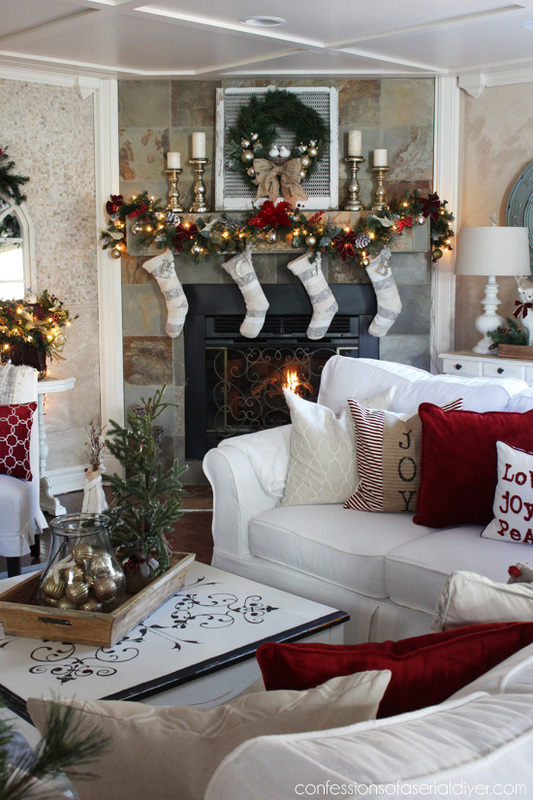 I love the color scheme that you chose and definitely love that the four of your have matching stockings. These are going to look great on your mantel for Christmas. These are fantastic! I love yours SO much better than the crazy brightly colored Anthro version. Great knock off and choice of colors! These turned out so cute! I can’t wait to make my very own. Great job! Thanks for the inspiration! These are incredibly gorgeous. If I would have the time on my hands, I would do this. But these are so beautiful that I would spend the $48 for you to make a version of the grey, cream and whites stockings! Unfortunately for me I just purchased new stockings last year. Bummer! I love how these turned out! 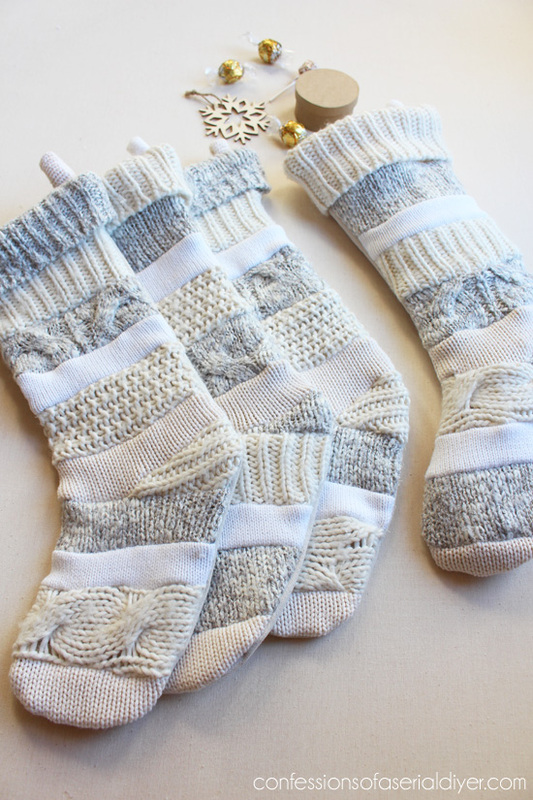 I’ve wanted to buy knit stockings for the past couple years, but haven’t because they’re too expensive. Yours is the first DIY tutorial I’ve seen that looks just as good (if not better!) than the store bought versions! I’m already mentally digging through my closet for old sweaters I can cut up :). Christy I absolutely love these! We need new stockings and every year I say “this year” I’d love to make these..such a good tutorial too! Bahahahaha! Seriously…I love them! They’re so beautiful!!!!!!! Christy, I love your stocking better than the original! I can’t wait to make one or two! Boys, I have two and I would imagine them saying something like that when they were younger. They are in their 30s now and married with children of their own. Oh Christy!! You did such a FABULOUS job!!!! I want a dozen of them!! So pretty!! I love your version better. It turned out great and best Knock off for sure. I absolutley LOVE these!! I was looking for some fun ideas to make new stockings for our family this year, and I think i”m going to have to make these!! Christy- great stockings idea for Christmas. They look amazing. I enjoy decorating for Christmas and hope to see some of your great ideas. I have a question, when you used chalk paint on furniture, do you use wax? Thanks for thinking we are talented 🙂 We think your blog is awesome! These are gorgeous, Christy! I had a bunch of sweaters that I bought at the thrift store with so many plans….never used them and just purged them this past summer….now I’m kicking myself! Totally in love! Looks amazing! Thanks for sharing with us at Your Designs This Time! Awesome, love ’em and pinned ’em. Wow! I really like yours much better than the Anthro ones! 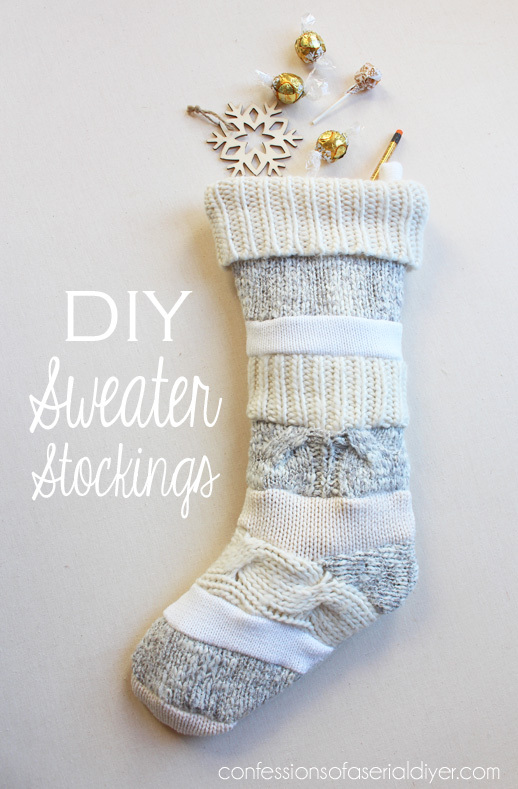 I am determined to make my own stockings this week, so this post is very timely! YES! Anther project I can do with old sweaters! These are amazing and you totally rocked the texture and color theme! Nice job! Hey Christy! Unanimous vote! We are featuring this project on Saturday’s Found & Foraged party this Saturday! Hope you come back to share another amazing project! These are awesome- soooo in love. We are featuring these tonight at Found & Foraged!! Unanimously adored. 🙂 xoxo!! Thanks again for sharing your great projects! I think the Anthro stocking has more pizzazz. But if the beiges and greys rock your boat, that’s excellent. You never know what people find appealing. Christmas clowns are a perfect example. And I love Christmas clowns too…how did you know that? Only mine are dressed in beige and grey sweaters, you know how understated colors rock my boat. Hi Christy! 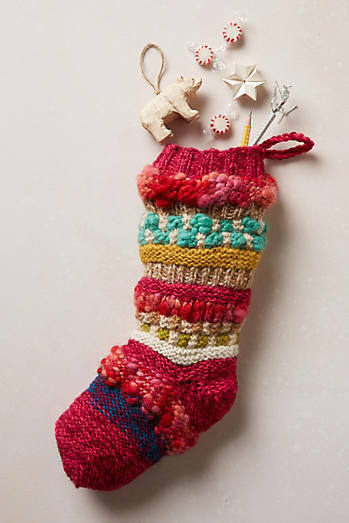 I just love this stocking. I remember pinning it last year. It’s just adorable. I selected it as my Inspired by You Friday Feature. I apologize, I meant to tell you yesterday but the day got away from me. Thanks again for joining our link party and hope to see you again this Sunday. LOVE LOVE LOVE! I’m making these next year for my whole family! They are so adorable! Pinning!!!! These are really cute Christy! I’m glad we got together for this little roundup!